In our house watermelon is a summertime staple. When you think of watermelon typically you think of munching away at the red juicy flesh that is inside of the hard green rind. Most would simply toss the rind but what you may not know is how nutritious that rind actually is. 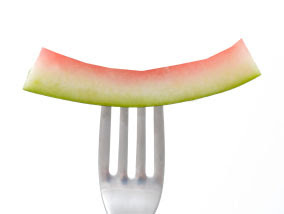 As with lots of other fruits the exterior "skin" or rind contains more nutrients than the actual watermelon. Remove the outer green skin from the watermelon rind and discard. Place cubed rind, tequila, agave nectar and lime juice in a blender and blend until slushy. For a frozen margarita, add in 1 cup of ice and blend or simply serve over ice in a sugar or salt rimmed margarita glass!